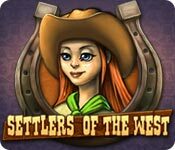 Settlers of the West puts you in charge of city planning in the 1850's American frontier! Tame the wild west from the comfort of your couch as you join Lucy or Walt's epic adventure along historic trails. You decide what to build, what to upgrade, and what jobs to assign Settlers to so that your settlements flourish! Trading posts, saloons, churches, you name it! 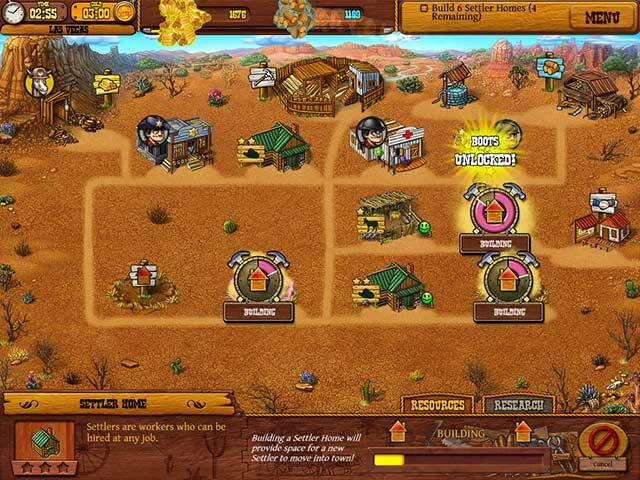 Almost 30 unique and upgradable buildings await with wagonloads of personality in this entertaining town and resource management adventure! Settlers of the West is rated 3.6 out of 5 by 34. Rated 5 out of 5 by margaretwhitley from Incredibly fun game!! This game is so much fun. Would recommend it to everyone. Buy it and have a great time. Rated 5 out of 5 by arnold1049 from LOVE ANYTHING WESTERN I'm always keeping my eye out for American West-themed games and I immediately played the demo for this game. Time Management games are not my favorite genre so I haven't played that many. This game ranks at the top of the ones I have played. The history of the American western migration is covered very well in this game. Building settlements along the route of the trails west as well as the background information on the famous bandits of the period give the game a very realistic feel. The levels of difficulty are based on how fast the pace of the game is. I'm not sure what this means, but I think it means the target time to finish a settlement is increased, giving you more time to complete the tasks. That is very helpful to me as I'm one of the people who aren't fast clickers. This slower pace also allows me to enjoy this game and soak up all the information on this period of American expansion that is available in the game. I started out at Normal, but ratcheted back to Novice in order to try to get more gold awards. I'm not sure that it helped much, as I didn't have much time left to play the demo when I changed the difficulty level. I am not sure exactly what criteria is used to assign the level of award to my gameplay. I got gold, silver and bronze awards during the demo but had no idea what I did or didn't do that resulted in these levels being assigned. That will be something I will look for when I go back to play the game again as I purchased it. And the best thing about it was it (and all Time Management games) were on sale today for 50 percent off. As the game moves from one location (towns on the trail west) to the next, each Settlement must be built from scratch. Mines, lumber yards, trading posts, etc. must be built over and over again. But each Settlement gets a little more complicated with more tasks added. 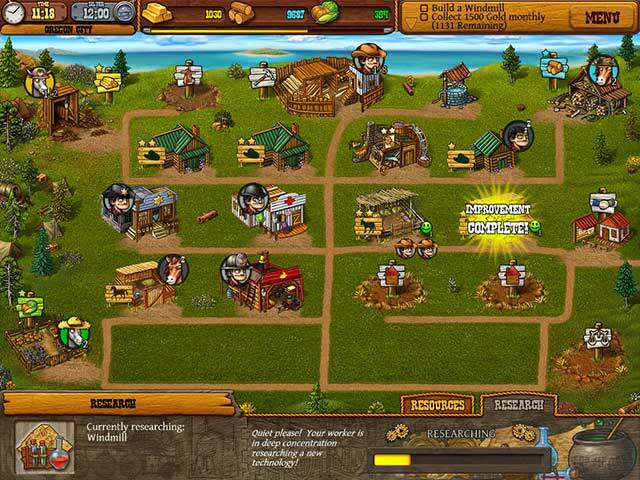 It has all the elements of time management games; collecting resources, hiring workers, etc., etc. One thing I liked about this game as opposed to others is that you are not required to pick up the resources that are produced by the various buildings/industries. They add to the resources automatically. There are also achievements to be won, like collecting x amount of lumber, gold, etc. Capturing the bandits is also part of the achievements but I didn't get far enough into the game to figure out how that works. This game intrigued me from the start. It is very well done with great graphics. Rated 5 out of 5 by lovemybook from Well Planned Strategy Resources and Roads Game I play every one of these type of games - My Kingdom for the Princess, Northern Tales, Royal Envoy, and even the more unusual ones like Outta this Kingdom and 12 Labours of Hercules. I love them all - it's my fave genre. This one is a gem that didn't get a lot of attention. It's well planned and has a lot of careful thought that's gone into it. It's not excessively clicky, everything is planned just right. Things are properly highlighted and everything is clear and noted well - just the kind the stuff that says someone really put thought into putting the game together. Every single level has something new and different. It's also one of the few games that when I finished, I went on and did every single level in the "platinum" timing. Now I always do all the games in the timed method, but I usually don't go on in the hardest or "expert" mode - normal is usually good enough for me. This is the first game that I went back and played the entire game in expert mode, and it was a good but not completely impossible challenge. I didn't count the levels, but I'm sure there were at least 45, so doubling that makes a LOT of gameplay. The only negative for me was the story cartoon in-between could have used a little more work. The story itself was actually pretty cute - a girl getting taken advantage of by a rotten crook while she's townbuilding - but the rest of the game was very well put together. I REALLY enjoyed this game. It's a hidden gem. Loved it, , and I highly recommend if you like these games! Rated 5 out of 5 by TMFanatic from Hard but not Impossible! Absolutely love this game and most TM games in general. It is true that this game requires a bit more thinking and planning but overall I found it challenging. I was able to complete all levels with 'diamond' time after playing consistently over a few days. The story line was cute and although there weren't very many tips I still enjoyed the game play. I highly recommend this game to anyone with some time to kill and the willingness to be patient and think a bit! Rated 5 out of 5 by aphrahannah from Loved this game I was pleasantly surprised by the challenge this game provided. I am always aiming for the gold on every level and this is one of the few games that I have not been able to do that on... yet! I still have one level on silver, 3 on gold and all the rest on platinum. A few games released nowadays are over and done with in a few hours, this is actually worth the money I spent on it. I will be going back to it every now and then to try and get those last achievements. Not one to be immediately deleted from my computer, unlike so many others! Rated 5 out of 5 by hbtHeather from Great Game I bought this game a little over a month ago, and I still haven't beat it yet. That is saying a lot, I usually finish TM games within a day or two, but this game is very challenging. The graphics are good, and the music is not too annoying, but the time to finish gold is tight, and you cannot advance with out getting gold stars. Once you have gotten a gold star on every level, you can go back and play each level again for diamond time, I have gotten a diamond star on every level but the last level (the time limit is 20:30, that is twenty minutes and thirty seconds). I believe more levels will be unlocked once diamond time is achieved on every level. Oh, and I am playing on Normal difficulty, I cannot imagine what the challenging and pro player levels are like. I do recommend this game, only if you are ready for a challenge, and are patient enough to replay levels. Rated 5 out of 5 by EMSeifert from Great TM game I found some of the comments below giving the game a low rating confusing. Reviewers were complaining about the challenge even at the novice level, and yes, it is a challenge even at the novice level. But there is an option to play at the relaxed mode, which is not timed and which opens up the entire map for play. Did they not notice that they could play it relaxed and untimed? If you do play at the challenge mode, you have a choice of difficulty from novice to expert. I seriously suggest starting at the novice level as it is not that easy to get gold on all the levels. Yest, I had to replay some of the levels to up them from bronze to gold or silver to advance on the map. But it is doable. I love how you can use the mules/horses/oxen in the mines/lumber/farm and even the trading post. But you do need a human to be the builders/doctors/researchers/sheriffs. Sometimes you have to juggle how many human buildings you need vs the the stables to complete the level. It is a bit confusing sometimes to know what all the goals are. A couple of times, I thought I was finished when another goal popped up. The best way to complete the level is to meet the goals in order and not jump all over the place, though you can normally save the sheriff/jail building until the end. Someone mentioned you needed to drag the worker to the doctor's office. That is incorrect. If you do have the doctor's office, the worker (including the animals) will go by himself. Someitimes, it seems as if the workers aren't producing as much as they need to. The trick to that is to improve the buildings they live in, not just upgrade them (upgrading adds more workers to the building, but it doesn't make them happier); it makes them more productive. All in all, this is one game that has a lot of replay value. But if it gets too hard, you can switch to the relaxed mode at any level. Rated 5 out of 5 by Jexzl from Not easy, but fun! I wouldn't recommend it for beginners, but if you're a fan of the genre, you'll probably love it. I spent some time retrying each level again and again, but I enjoyed the challenge. Although I didn't make gold on every level, I never had a problem reaching the next ones. ( I finished with 36 Gold and 7 Silver.) It's challenging, but not frustrating, if you get the hang of it. Rated 5 out of 5 by rmulli from My apologies to the slow at hand This may be the best game TM game Big Fish has ever released. I have played for 5 days on reg. and have still not gotten all gold. I have read the reviews from people who do not like the fact that there is not a casual mode. Easy fix, DONT PLAY!!!! I am sorry your hand are "not what they used to be" but this games challenges the mind more than the hands. It is a refreshing break from fish and farms! Good job on this one BF! Rated 5 out of 5 by amgood49 from Awesome This game is so cool and I have fallen for it hook, line, and sinker. It has 4 difficulty levels I put it on expert but I love a good challange, will go back and play it in pro mode. once you figure out what plan you need its easy and fun great game hope we get northern tale 2 and monument builders statue of liberty soon. i would buy way more games if they had them.